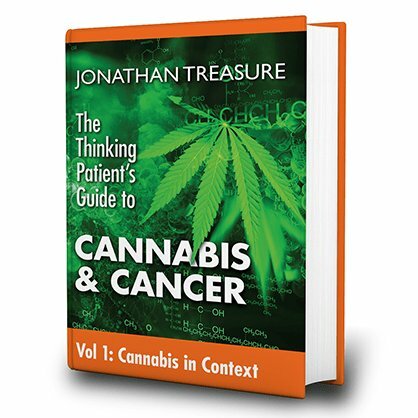 An excerpt from Jonathan Treasure's new book, The Thinking Patient’s Guide to Cannabis & Cancer. Photo: "The Thinking Patient’s Guide to Cannabis & Cancer"
Adapted from the forthcoming book, The Thinking Patient’s Guide to Cannabis & Cancer (vol. I) by Jonathan Treasure, which Project CBD highly recommends. A free download of the complete 2nd chapter (partially excerpted below) is available here. Seeing herbs as either poison or panacea is unhelpful, but so is vilifying either modern mainstream or traditional herbal medicine. A more useful way to illustrate the differences between the two would be by comparing the approaches of a gardener and a mechanic. Mainstream medicine tends to see the body as a machine—albeit a complex one. A machine is understood in terms of basic principles of engineering design, where the assembly of component parts follow predictable rules of organization and behavior; a malfunction can usually be fixed by logical fault-finding (diagnosis) and mending or replacing the defective part—a mechanical approach. For herbal medicine, the body is more like a garden—an ecosystem unto itself, a complex network of inter-relating and interdependent systems in which the whole is more than the sum of its parts. Malfunction can arise from stressors or perturbances which, if uncorrected, lead to imbalances that, over time, manifest as patterns of disease. Fixing problems therefore involves adjustments to the terrain or ground… much like the job of a gardener. Put another way, when things go wrong, mainstream medicine tends to focus on the problem in terms of the pathology and the disease, whereas herbal medicine tends to look at the person who has the disease. In terms of cancer, this is classically described as the polarity between tumor and host, the latter being the terrain or ground in which the tumor develops. Extending our horticultural theme, cancer could be likened to an invasive weed. Weeds thrive in disturbed and neglected ground, so amending the soil (checking its pH, mineral content and feeding it with appropriate micronutrients) can prevent invasive weeds from taking root. Similarly, creating an internal “anti-cancer” garden or terrain within the body is one of the more important ways in which herbs can be used to prevent cancer and inhibit its progression. And, as is the case with chemotherapy and other heroic cancer treatments, killing weeds with poisons and herbicides that cause collateral damage to the surroundings is not necessarily the best way to clear them from a garden—although at times it may be the only way. In any event, there will always be gardeners who have a mechanical approach, and mechanics who can be as artistic as gardeners. In practice, especially with cancer where the situation is rarely simple, the smart patient will seek out gardeners who understand mechanics and mechanics who are gardeners.